At the very least, 2017 was a dense year for Liberland. Here is a quick overview of all the highlights of 2017 and a quick glimpse into Liberland’s 2018 plans. Over the past two and a half years, Liberland has proven that it’s a sovereign state at heart. First of all, more than 480.000 people requested citizenship, which is already a strong recognition. Among them are more than 150.000 eligible citizens who understand the spirit of the project. Processing these applications will require time. President Vít Jedlička visited 44 countries this year and spoke at 50 major events. You can find videos about Liberland in English, Czech and at least thirteen other languages. The team behind Liberland has recently drastically grown in size with more than 60 representative offices around the globe. Donors were increasingly numerous; people from all over the world have shown their support through a voluntary financial contribution. Liberland has shown its gratitude by gifting the donors Merits, the future currency also known as LLM. Please visit our donation page if you wish you make a donation as well. Liberland is very blessed with a huge team of devoted volunteers from all kinds of backgrounds: computer scientists, businesspeople, psychologists, economists, architects, translators, designers, experts in environmental issues, sociologists, filmmakers. It has become almost impossible to list all the ways supporters and future citizens can contribute. To name an example, Liberland has its own brand of beer and coffee! It’s diversity that makes Liberland a community, because what we all have in common isn’t wealth, social background, religion, ethnicity, or cultural habits… No, what gathers us in the first place is our taste for freedom, our belief that it’s worth attempting to create something different than what the current world has to offer. Liberland is still looking for new volunteers who want to become part of the movement, for the amount of work to make this dream come true is considerable. Please contact the representative of your country if you’re interested and give a thorough description of how you can contribute. You can gather more information about the core team in our most recent brochure, but remember that there are many passionate volunteers also working behind the curtain. One of the most welcome surprises of 2017 was the standing ovation President Jedlička received from dozens of US state legislators and senators at the American Legislative Exchange Council meeting. Mr President delivered an unmissable speech that was partly crowdsourced through social media. Liberland is now, more than ever, willing to establish friendly political relations with Croatia, and this year started well. Croatian parliament member Ivan Pernar officially proposed the recognition of Liberland and shared president Jedlička’s call to a peaceful collaboration. This proposal complements earlier discussions in Poland in 2016, when parliament members from Poland proposed the recognition of Liberland, and the victory in Croatian courts by Liberland citizens. Several appeals of unlawful arrests on Liberland territory were challenged and won in the High Court of Zagreb. Economists who have joined the Liberland community have stated that the whole region could benefit, estimating economic growth of $6,000 to $13,000 per person per year. In a letter to the Croatian parliament, President Jedlička stated that over 40.000 entrepreneurs from all over the world have expressed their interest in investing in Liberland. This could boost economic growth in Croatia by one percent per year and dramatically reduce unemployment in the whole region. Besides that, Liberland could be an example to the rest of the world on how smart social and technological solutions can create a radically free and prosperous society. This model can be copied anywhere on the planet and can cause a global revolution. The new year brings a lot of excitement as expansion plans have been discussed. Since Liberland is a state of mind and a community of people valuing freedom and decentralisation as much as possible, there could be more than one Liberlandian territory in the coming years. As you can see, Liberland is here to stay. Last but not least, Liberland signed a Memorandum of Understanding with Somaliland. The two countries agreed to cooperate and support each other during the mutual recognition process and on international fronts. Liberland is currently preparing an Initial Coin Offering (ICO) that will probably take place during its third anniversary on in April. The new cryptocurrency, called Liberland Merit (LLM), will be Liberland’s official currency. At the moment, Liberland is economically independent with a surplus of $350.000. All state reserves were divided between two major cryptocurrencies in the beginning of 2017: Ethereum and Bitcoin. The Euro will still be used as a reserve currency. In addition to offline activities, Liberland recently also expanded its online presence and will continue to do so in 2018. Liberland now has an official YouTube channel. Many channels created by supporters fizzled out after a few months of existence, so it was definitely time to create one with a steady flow of information. Besides Facebook and Twitter, you can now follow us on VK and Vimeo, and more will come in January. 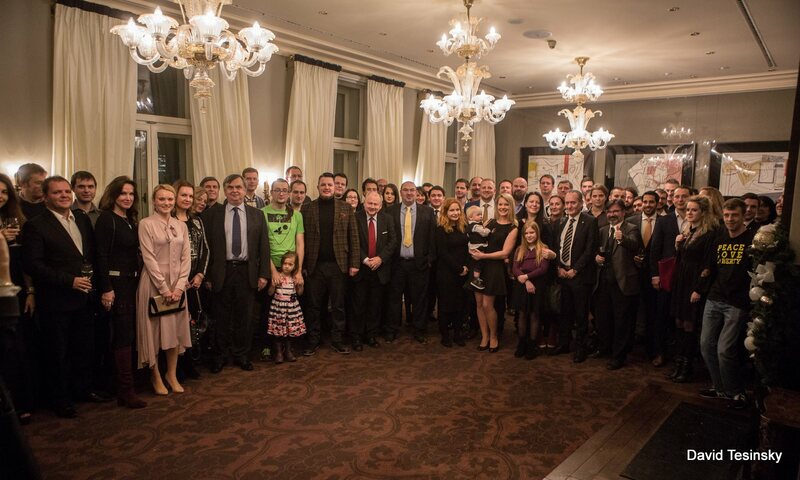 After a joyful Christmas party in Prague, the Liberland community is now preparing for the next year. On behalf of the whole team, the Free Republic of Liberland wishes you a happy new year!